In the eighteenth year (20-19 B.C.) of his reign Herod rebuilt the Temple on a more magnificent scale. There are many evidences that he shared the passion for building by which many powerful men of that time were moved. He had adorned many cities and had erected many heathen temples; and it was not fitting that the temple of his capital should fall beneath these in magnificence. Probably, also, one of his motives was to placate the more pious of his subjects, whose sentiments he had often outraged. The Jews were loth to have their Temple pulled down, fearing lest it might not be rebuilt. To demonstrate his good faith, Herod acccumulated the materials for the new building before the old one was taken down. The new Temple was rebuilt as rapidly as possible, being finished in a year and a half, although work was in progress on the out-buildings and courts for eighty years. As it was unlawful for any but priests to enter the Temple, Herod employed 1,000 of them as masons and carpenters. 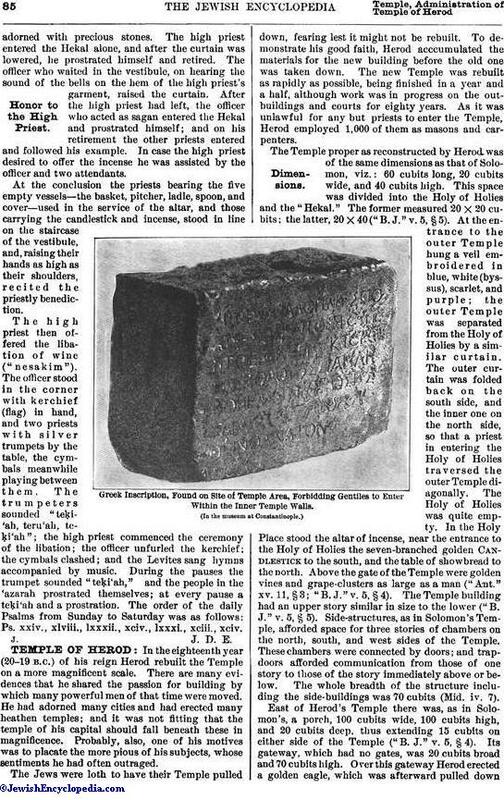 The Temple proper as reconstructed by Herod was of the same dimensions as that of Solomon, viz. : 60 cubits long, 20 cubits wide, and 40 cubits high. This space was divided into the Holy of Holies and the "Hekal." The former measured 20 x 20 cubits; the latter, 20 x 40 ("B.J." v. 5, § 5). At the entrance to the outer Temple hung a veil embroidered in blue, white (byssus), scarlet, and purple; the outer Temple was separated from the Holy of Holies by a similar curtain. The outer curtain was folded back on the south side, and the inner one on the north side, so that a priest in entering the Holy of Holies traversed the outer Temple diagonally. The Holy of Holies was quite empty. In the Holy Place stood the altar of incense, near the entrance to the Holy of Holies the seven-branched golden Candlestick to the south, and the table of showbread to the north. Above the gate of the Temple were golden vines and grape-clusters as large as a man ("Ant." xv. 11, § 3; "B. J." v. 5, § 4). The Temple building had an upper story similar in size to the lower ("B. J." v. 5, § 5). Side-structures, as in Solomon's Temple, afforded space for three stories of chambers on the north, south, and west sides of the Temple. 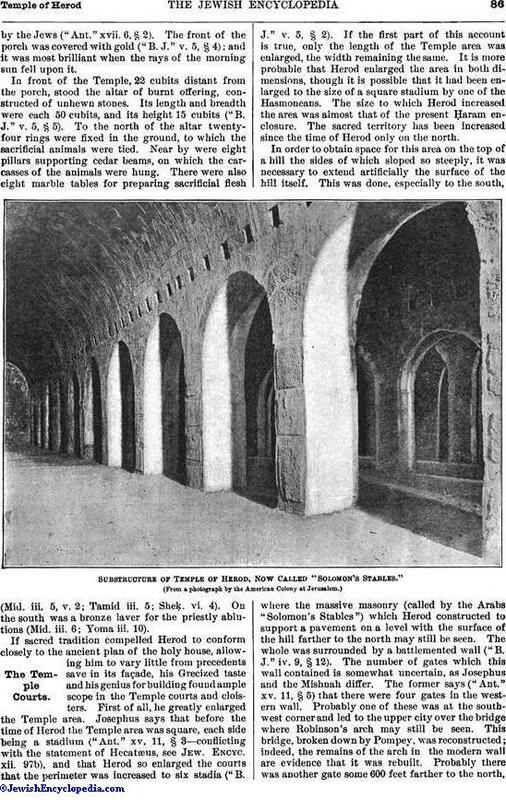 These chambers were connected by doors; and trapdoors afforded communication from those of one story to those of the story immediately above or below. The whole breadth of the structure including the side-buildings was 70 cubits (Mid. iv. 7). 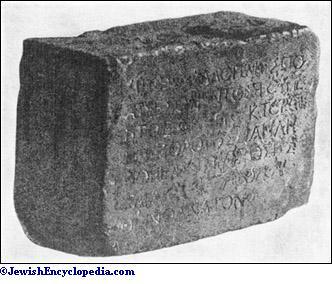 Greek Inscription, Found on Site of Temple Area, Forbidding Gentiles to Enter Within the Inner Temple Walls. In front of the Temple, 22 cubits distant from the porch, stood the altar of burnt offering, constructed of unhewn stones. Its length and breadth were each 50 cubits, and its height 15 cubits ("B. J." v. 5, § 5). To the north of the altar twenty-four rings were fixed in the ground, to which the sacrificial animals were tied. Near by were eight pillars supporting cedar beams, on which the car-casses of the animals were hung. There were also eight marble tables for preparing sacrificial flesh (Mid. iii. 5, v. 2; Tamid iii. 5; Sheḳ. vi. 4). On the south was a bronze laver for the priestly ablutions (Mid. iii. 6; Yoma iii. 10). 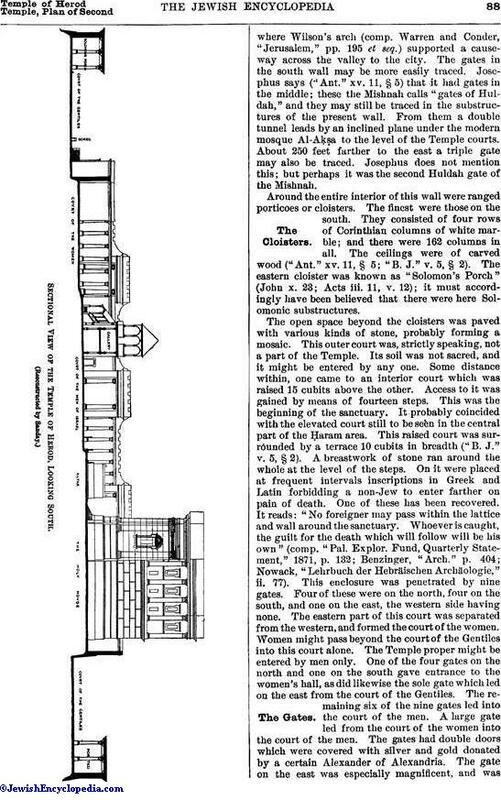 Substructure of Temple of Herod, Now Called "Solomon's Stables." If sacred tradition compelled Herod to conform closely to the ancient plan of the holy house, allowing him to vary little from precedents save in its façade, his Grecized taste and his genius for building found ample scope in the Temple courts and cloisters. First of all, he greatly enlarged the Temple area. Josephus says that before the time of Herod the Temple area was square, each side being a stadium ("Ant." xv. 11, § 3—conflicting with the statement of Hecatæus, see Jew. Encyc. xii. 97b), and that Herod so enlarged the courts that the perimeter was increased to six stadia ("B. J." v. 5, § 2). If the first part of this account is true, only the length of the Temple area was enlarged, the width remaining the same. It is more probable that Herod enlarged the area in both dimensions, though it is possible that it had been enlarged to the size of a square stadium by one of the Hasmoneans. The size to which Herod increased the area was almost that of the present Ḥaram enclosure. The sacred territory has been increased since the time of Herod only on the north. View of the Temple of Solomon. Sectional View of the Temple of Herod, Looking South. In order to obtain space for this area on the top of a hill the sides of which sloped so steeply, it was necessary to extend artificially the surface of the hill itself. This was done, especially to the south, where the massive masonry (called by the Arabs "Solomon's Stables") which Herod constructed to support a pavement on a level with the surface of the hill farther to the north may still be seen. The whole was surrounded by a battlemented wall ("B. J." iv. 9, § 12). The number of gates which this wall contained is somewhat uncertain, as Josephus and the Mishnah differ. The former says ("Ant." xv. 11, § 5) that there were four gates in the western wall. Probably one of these was at the southwest corner and led to the upper city over the bridge where Robinson's arch may still be seen. This bridge, broken down by Pompey, was reconstructed; indeed, the remains of the arch in the modern wall are evidence that it was rebuilt. Probably there was another gate some 600 feet farther to the north, where Wilson's arch (comp. Warren and Conder, "Jerusalem," pp. 195 et seq.) supported a cause-way across the valley to the city. The gates in the south wall may be more easily traced. Josephus says ("Ant." xv. 11, § 5) that it had gates in the middle; these the Mishnah calls "gates of Huldah," and they may still be traced in the substructures of the present wall. 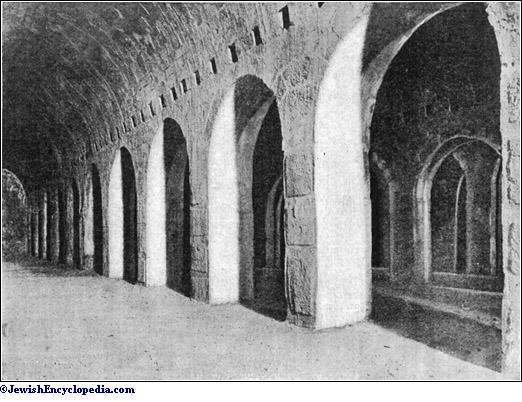 From them a double tunnel leads by an inclined plane under the modern mosque Al-Aḳṣa to the level of the Temple courts. About 250 feet farther to the east a triple gate may also be traced. Josephus does not mention this; but perhaps it was the second Huldah gate of the Mishnah. Around the entire interior of this wall were ranged porticoes or cloisters. The finest were those on the south. They consisted of four rows of Corinthian columns of white marble; and there were 162 columns in all. The ceilings were of carved wood ("Ant." xv. 11, § 5; "B. J." v. 5, § 2). The eastern cloister was known as "Solomon's Porch" (John x. 23; Acts iii. 11, v. 12); it must accordingly have been believed that there were here Solomonic substructures. The open space beyond the cloisters was paved with various kinds of stone, probably forming a mosaic. This outer court was, strictly speaking, not a part of the Temple. Its soil was not sacred, and it might be entered by any one. Some distance within, one came to an interior court which was raised 15 cubits above the other. Access to it was gained by means of fourteen steps. This was the beginning of the sanctuary. It probably coincided with the elevated court still to be seen in the central part of the Ḥaram area. 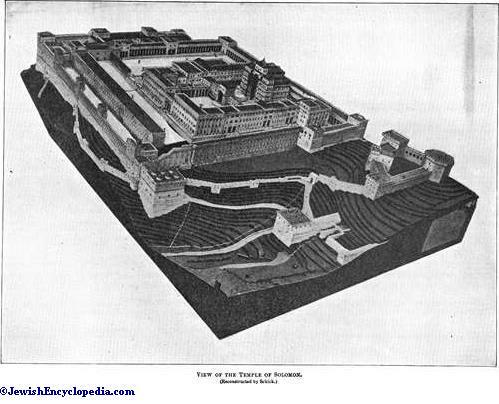 This raised court was surrounded by a terrace 10 cubits in breadth ("B. J." v. 5, § 2). A breastwork of stone ran around the whole at the level of the steps. On it were placed at frequent intervals inscriptions in Greek and Latin forbidding a non-Jew to enter farther on pain of death. One of these has been recovered. It reads: "No foreigner may pass within the lattice and wall around the sanctuary. Whoever is caught, the guilt for the death which will follow will be his own" (comp. "Pal. Explor. Fund, Quarterly Statement," 1871, p. 132; Benzinger, "Arch." p. 404; Nowack, "Lehrbuch der Hebräischen Archäologie," ii. 77). This enclosure was penetrated by nine gates. Four of these were on the north, four on the south, and one on the east, the western side having none. The eastern part of this court was separated from the western, and formed the court of the women. Women might pass beyond the court of the Gentiles into this court alone. The Temple proper might be entered by men only. One of the four gates on the north and one on the south gave entrance to the women's hall, as did likewise the sole gate which led on the east from the court of the Gentiles. The remaining six of the nine gates led into the court of the men. A large gate led from the court of the women into the court of the men. The gates had double doors which were covered with silver and gold donated by a certain Alexander of Alexandria. The gate on the east was especially magnificent, and wascovered with Corinthian bronze. The greatest of all the gates was, however, the "gate of Nicanor," which led from the court of the women into the court of the men. 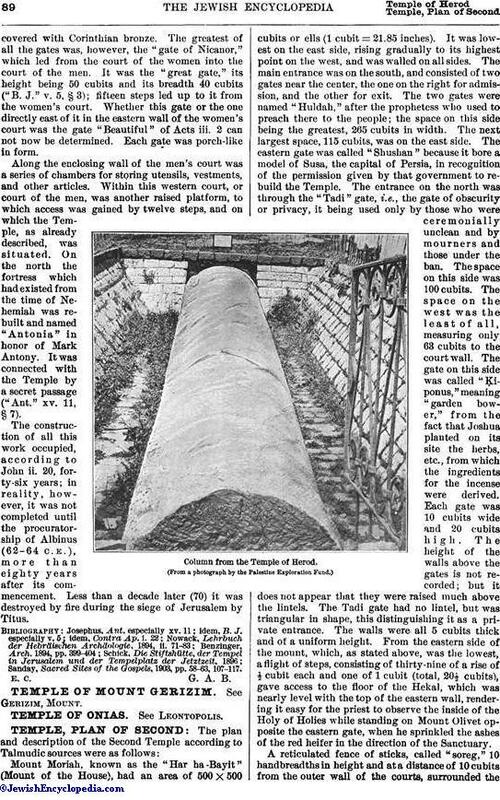 It was the "great gate," its height being 50 cubits and its breadth 40 cubits "B. J." v. 5, § 3); fifteen steps led up to it from the women's court. Whether this gate or the one directly east of it in the eastern wall of the women's court was the gate "Beautiful" of Acts iii. 2 can not now be determined. Each gate was porch-like in form. Along the enclosing wall of the men's court was a series of chambers for storing utensils, vestments, and other articles. Within this western court, or court of the men, was another raised platform, to which access was gained by twelve steps, and on which the Temple, as already described, was situated. On the north the fortress which had existed from the time of Nehemiah was rebuilt and named "Antonia" in honor of Mark Antony. It was connected with the Temple by a secret passage ("Ant." xv. 11, § 7). 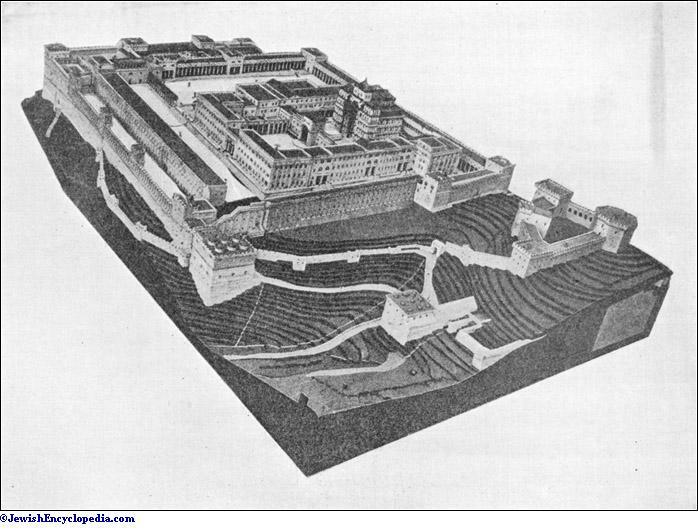 The construction of all this work occupied, according to John ii. 20, forty-six years; in reality, however, it was not completed until the procuratorship of Albinus (62-64 C. E.), more than eighty years after its commencement. Less than a decade later (70) it was destroyed by fire during the siege of Jerusalem by Titus. Sanday, Sacred Sites of the Gospels, 1903, pp. 58-63, 107-117.